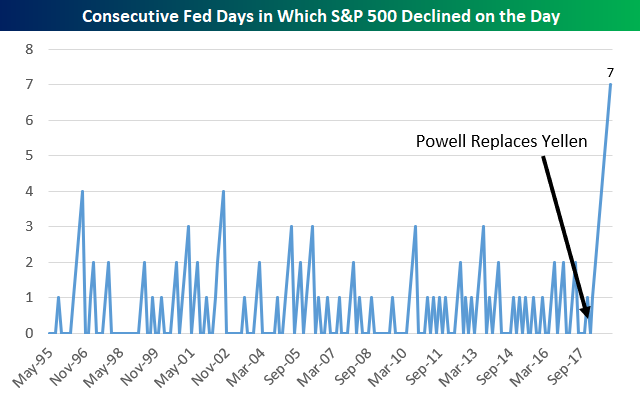 Jerome Powell has been in charge of the Fed for seven FOMC meetings at this point, but he has yet to see the S&P 500 experience an up day on any of his Fed Days! The current streak of 7 Fed Days without an up day is by far the longest losing streak on record. In our newest B.I.G. Tips report available to Bespoke Premium and Bespoke Institutional members, we look at current odds for rate hikes (or cuts) over the next year, and we update our charts and tables showing historical stock market performance on and around Fed Days. Be sure to give it a read ahead of tomorrow’s 2 PM ET FOMC announcement. To unlock the full report, start a two-week free trial to either Bespoke Premium or Bespoke Institutional.